We Drink Your Milkshake! : New G.I. JOE RETALIATION Trailer Drops! New G.I. 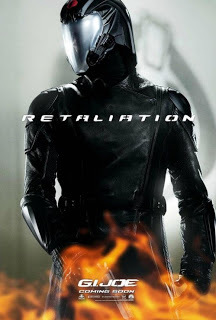 JOE RETALIATION Trailer Drops! The first G.I. JOE film did not interest me. At all. It looked silly and boring. However, after much persuasion, my cohort convinced me to watch it, and man was I shocked at how fun the film was and how much I ended up enjoying it. When the sequel was announced, there was excitement all around the blog. While seeing MISSION: POSSIBLE - GHOST PROTOCOL in IMAX, we saw this trailer and nearly jumped out of our seats with excitement. Unfortunately, to everyone's dismay, the film got pushed back from a June 2012 release to March 2013. Studios initially said it was to up-convert to 3D; a decision I would assume one would make before releasing a bunch of trailers or a multi-million dollar Super Bowl spot. Then reports came out that producers wanted to cash in on the success of Channing Tatum and expand his part in the second film. That, I can agree with. But now we're in the home stretch to find out if delaying RETALIATION almost a year will be worth it. Javi seems to think so. This film is one of his most anticipated of 2013. Thanks to Break.com, we have a new trailer for the film which features more ninjas and Bruce Willis. How badass will that mountain fight scene look in IMAX? I'm on my little computer right now, but I got that breathless feeling you get when you go over the first hill of a roller coaster. As per the studios, post-conversion 3D can be a quick and messy process. However, since this film was given ample time, maybe this post-conversion won't make us want to claw our eyes out. There will be an extended four minute preview in front of HANSEL & GRETEL: WITCH HUNTERS in both IMAX 3D and non 3D.